SIS data can be uploaded through the SIS Imports link in Account Settings. SIS data is only accessible at the account level and cannot be added to sub-accounts. The SIS Import page supports a few formats for standard imports to Canvas: Instructure formatted CSV or zipfile of CSVs, IMS Enterprise Specification XML zip, or Banner Grade Exchange Results XML. Files can be set for a full batch update and to override UI changes. Please ensure you are aware of the risks associated with these upload options. For more details about these risks, please view the SIS Imports lesson. SIS Imports are added to a queue that processes each imported CSV separately (whether uploaded individually or within a ZIP file). Import errors are displayed in the SIS Import page. Before importing SIS information, practice using the API to manage SIS data. You should also use your test environment to avoid conflicts with your live production data. Once you have confirmed your data in your test environment, you can re-apply your SIS integration to your production environment. Additionally, some SIS data options are only available via the API. 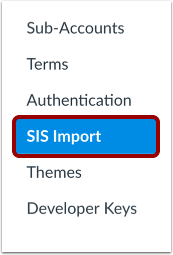 SIS Imports must be enabled by your Customer Success Manager before files can be uploaded to your account. Importing SIS files is an account permission. If you do not have access to manage SIS files, your institution has restricted this feature. Before setting permission for a user role, you must ensure the role you want to assign the user already exists in your account. Learn how to create an account-level role. In Account Navigation, click the SIS Import link. Click the Choose File button and locate the SIS import file from your computer. In the Import Type menu, select the type of import you are uploading into Canvas. By default, the menu selects the CSV import option. If you want to create a full batch update, select the This is a full batch update checkbox . In the Term drop-down menu , select the term for the full batch update. With this option, any courses, sections, or enrollments with an SIS ID record in Canvas that is linked to the Term selected in the drop-down can be deleted. For enrollments, this option means the linked user and course/sections require SIS IDs. A Canvas record will be deleted if it is not included in the current import file. This option will only affect data created via previous SIS imports. Manually created courses, for example, won't be deleted even if they don't appear in the new SIS import. Notes: Ensure you are aware of the associated risks before selecting this option. If you want to override changes in the user interface (UI), select the Override UI changes checkbox. This change tells Canvas to overwrite any "sticky" data changed by users in their accounts with the data your are importing. If this box is NOT checked when doing a new users import, no name changes will be overridden in the UI, but if the user removed their listed email address it will be re-added but not marked default. If this box IS checked when doing a new users import, the full name and sortable name will change, but the display name is not changed. The email address is added but still not marked default. Overriding UI changes also allows one of two additional options: process as UI changes or clear UI-changed state. You can only select one option. Clear UI-changed state : removes the "stickiness" of all data that exists in this import; future imports with this data will not indicate any data in the UI as "sticky"
Click the Process Data button. When the import has processed, Canvas displays the results of the imported file, along with up to 50 errors and warnings. If you imported a full batch update, the results also show the number of deleted items removed from the account. 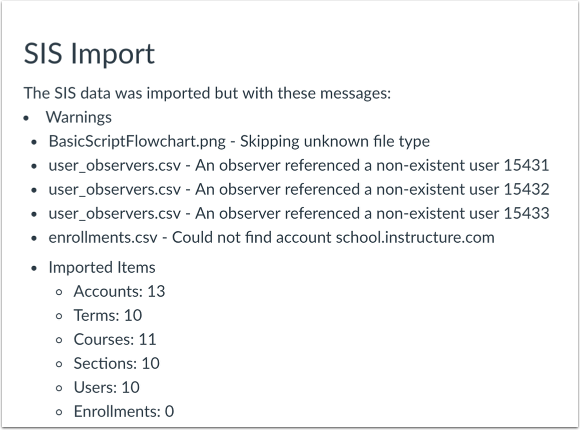 Deleted items include enrollments, courses, and sections. After you refresh the page, this information will stay in the SIS Import page under the Last Batch heading until another import is made. If you want to download all warnings and errors from your last import file, return to the SIS Import page. Under the Last Batch heading, click the Last Batch download icon. 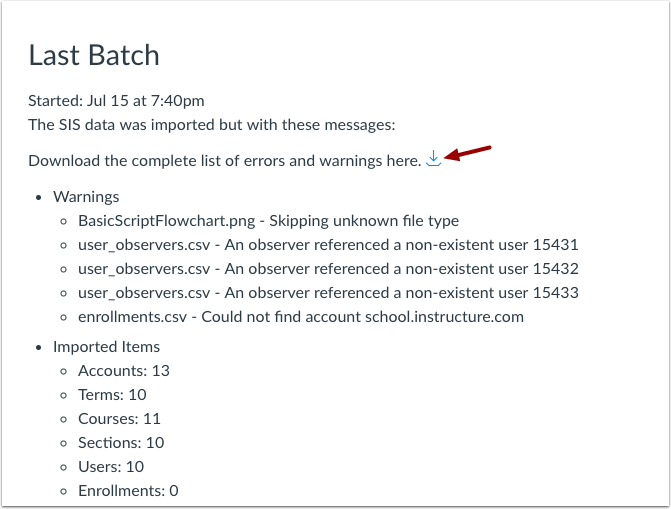 The icon will download a CSV file with all errors and warnings from your last import. You can also use the SIS Import Errors API for additional troubleshooting details, which will return the CSV line number where the error occurred. Note: You may need to refresh the page to view the download icon. Previous Topic:What student information system (SIS) integrations are available in Canvas? Next Topic:How do I format CSV text files for uploading SIS data into a Canvas account? Table of Contents > SIS Imports > How do I import SIS data to a Canvas account?